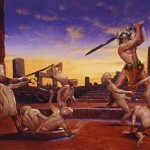 Myth was a massive game on the C64, which won awards because of its style and class it pocessed. System 3 announced the work being started on a sequel, codenamed ‘Dawn Of Steel’. The planned sequel would have had more stunning levels to do with Myths and Legends etc. Not much of an outline was given on this game of what it would have been like, but system 3 as usual promised a sequel which would beat its original. 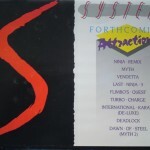 Brendan Phoenix in recent times found a little leaflet from System 3 which mentioned Myth 2 as an up and coming title. Here is is. Ideas were drawn up, but actual coding was rumoured to have never began. In the end the idea remained gathering dust. But interestingly in 2014, a contributor on EAB spotted that artist Les Edwards had produced some cover art for a game in 1991 called “Dawn of Steel” .. which must have been Myth 2. Here is the screen below, which looks very Myth like. As for the game itself, did it ever get started?… do you know? “We never started Myth 2 on C64. Robin and Doc did a lot of the Amiga graphics but the original graphics were done by Bob. The original character wore jeans and was more like a teen hero. So confirmation that there was never a sequel started on the C64, and very much case closed! Talking about different versions, Myth was also ported to NES as “Conan”.